Lucinda Williams' latest release Essence isn't as immediately gripping as her critically-acclaimed Car Wheels on a Gravel Road. This time around, instead of making a bold pronouncement, the talented songwriter delivers a delicate, subtle statement that slowly seeps under your skin. Its somber melodies haunt; its melancholic lyrics wallow in their sorrow. But make no mistake, Williams has crafted another gem, a disc that is nearly as strong as its predecessor. 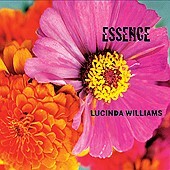 Recorded over the span of just a few months (instead of several years), Essence has a more unified lyrical thread that binds its songs together, more so than any of Williams' previous efforts. Fueled by the pitfalls of her personal life, the disc mines the familiar ground of relationships, but Williams has a knack for parlaying her experiences into a commentary on the human quest for intimacy, forgiveness, and spiritual awakening. The opening track Lonely Girls is a heartbreaking mantra, and its minimalist production only adds to its solitary, desolate ambience. Williams yearns for connection on Steal Your Love and seeks redemption on Broken Butterflies. And on Blue, Williams doesn't hide the fact that she finds solace in Joni Mitchell's release of the same name — a quiet, contemplative album without which Essence never could have been made. As if preying upon the raw emotion of her lyrics, Williams turns toward a looser recording style, allowing her poetic words to sink into their accompaniments. At times — like on the weepy Lonely Girls or the reflective Bus to Baton Rouge — the songs recall the claustrophobic atmosphere of Bob Dylan's Time Out of Mind. On other tracks, Williams and her band comfortably let the groove take control, allowing Steal Your Love to drift longingly amidst the painted guitars of Charlie Sexton and Bo Ramsey, pushing Out of Touch and the title track along a pulsating beat à la Tom Petty, and fueling the serpentine fire of Get Right with God. It is this latter track that fans of Car Wheels on a Gravel Road will find to be the most accessible, but those open to Williams' more meditative side will find satisfaction throughout Essence's subtle beauty. Essence is available from Barnes & Noble.